This weekend’s Makerbot Madness was amazing. We not only had the usual flood of Makerbots, but we took a look at two new Mendels in progress. At one point, we had 8 3D printers in the shop, which I think is a new record. First up is the Open3DP Mendel. 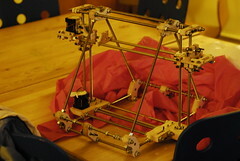 It was born from a commercial FDM printer, and the build quality is excellent. It should be running smoothly for next weekend’s Discovery Days Open House at the UW. I highly recommend going to this event. 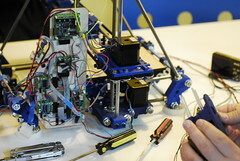 It’s running the TechZone reprap electronics and a Wade’s Stepper Extruder. We spent a bit of time debugging the electronics, and although we didn’t have it printing by the end of the night, it’s definitely on track to be replicating soon. Second is Sharon Morrison’s Wood Mendel. She has been building this repstrap with a scroll saw and a drill press. She’s gotten pretty far in the past couple of weeks, and I’m going to guess it will be printing soon. Sharon has been coming on Saturdays for a while now, and tested the 3D printing waters by designing and printing an awesome banana slug for Thingiverse. You may also notice a new addition to the shop. 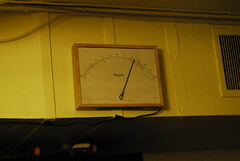 Jon Chandler dropped off an awesome servo clock, which conveniently covers our hours of operation. If you hang out until midnight, you can watch it snap back to 0 right before we lock up. Don’t look away though, it happens fast.